If you’re in the market for gutter guards or have gutter guards that are not performing properly, this article reveals what gives good gutter guards a bad name! Have you ever read a review of a product that you know is good, but the reviewer tore it to shreds? I see this all the time. A product has a bunch of 4 and 5 star reviews, and then there are a few outlier reviews that are 1 and 2 stars. 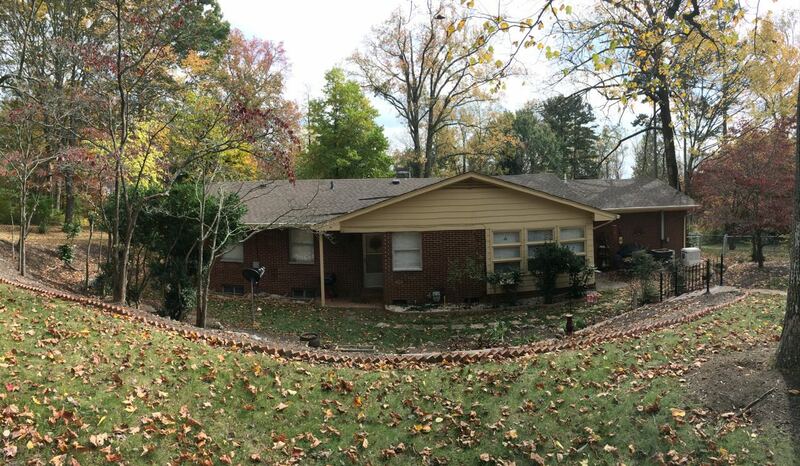 We recently received a phone call from a homeowner in Knoxville, Tennessee, who wanted to know if we could help her with a problem she was having with her gutter guards. The gutter guards had been installed for a year or so. She attempted to reach the company that installed her gutter guards to get help with the problem, but, SURPRISE, they were out of business! She searched around the web and came across our company, Gutter Guards Direct, and called to tell me her story. She hired a company to install a microscreen gutter guard called Rhino/Xtreme. She said that after the gutter guards were installed, water began leaking into her basement. I believe she told me that she paid about $3000 to have Rhino gutter guards installed. For $3k, she got a world of headaches, including water cascading over the gutter guards, onto a stone planter box built-in to her front porch, and into her basement. She had installed a blue tarp to catch and divert the water away from her house. Despite these efforts, water was still landing on the tarp and entering her basement. In fact, gutter guards are a great way to keep water OUT of basements, so, sight unseen, this was a bit of a mystery to me. I told her that I needed to see the gutter guards in person to see what was going on, so we set up an appointment for me to visit. Her home is perched on a hill, with a steep driveway, and lots of large, mature trees overhanging the house. 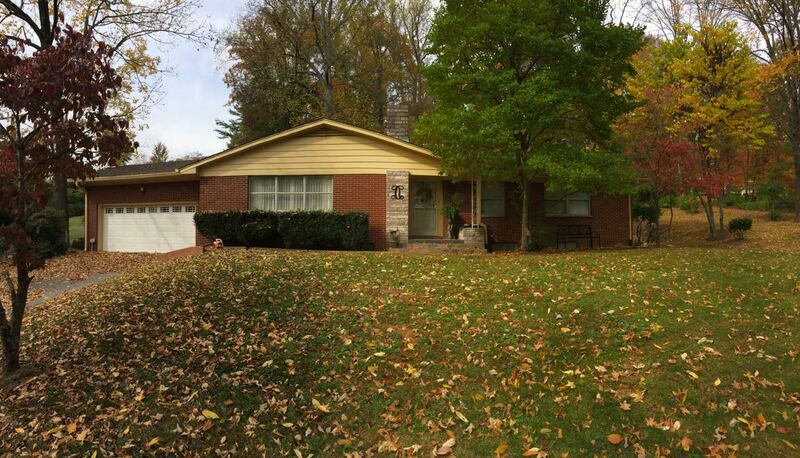 The house is a typical midcentury ranch with gutters across the front and back of the home. The roof is a low slope 4/12 pitch, which makes it easy to walk, but the shallow pitch is a magnet for leaves, sticks and debris. I did a quick walk around, grabbed my ladder and took a look at her gutters. What I saw next shocked me! The gutters were covered with leaves and sticks. That in itself is not the end of the world with microscreen gutter guards, but when I wiped away the leaves, I noticed the gutter guards were pitched backwards — towards the house — which is a no-no, and the gutter guards were undersized for the 6” gutters. That’s right, these yahoos installed 5” gutter guards on 6” gutters. Rhino gutter guard is designed to be installed by screwing the front edge into the front lip of the gutter and the back upward flange into the fascia board behind the gutter. These guys screwed the gutter screens onto the front lip and let the gutter guards hang loose. Guess what happens when the guards are screwed front edge of the gutter but not the back edge of the gutter? 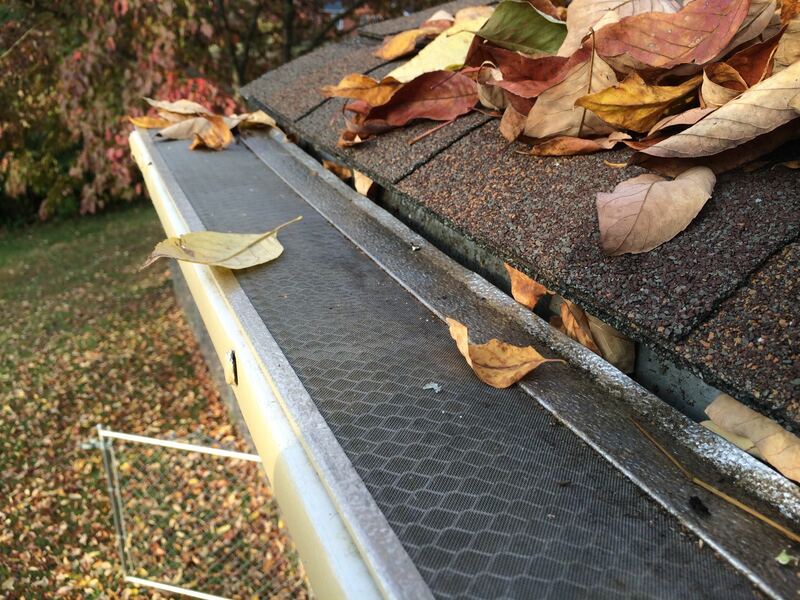 At minimum, the gutter guards would sit flat. However, in this case, because the guards were too small for the gutters, they actually pitched backwards. When a guard pitches backwards, towards the house, it creates a V between the edge of the gutter and the roof line, allowing anything that rolls into the gutter to sit. And sit. And sit. Most of what collects won’t go anywhere, and more stuff will accumulate on top of the covers. The next thing you know, you have a real problem. To add insult to injury, it was evident that these gutter guards were previously used because they had screw holes in the back flange but not a single screw to be found in any of those holes. The inside miters were also cut wrong. To sum it up, this was a first-rate hack job! And, this, my fellow homeowners, is how good gutter guards get a bad name! What was our solution for the homeowner? I broke the bad news to her. 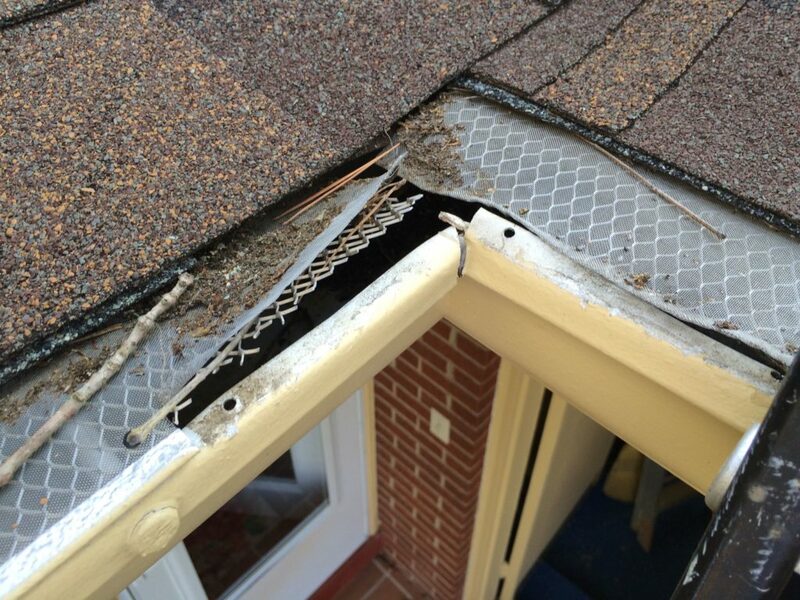 She chose a good micromesh gutter guard system to begin with, so that wasn’t the problem. “The problem,” I said, “is you hired installers who ripped you off. 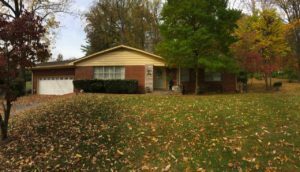 They knowingly used undersized gutter guards and installed them incorrectly.” I told her that there wasn’t any way to reuse what she had already paid for and she was going to have to replace all of the gutter guards with a new system. We installed 6″ Rhino/Xtreme gutter guards to ensure that she would have a continuous forward pitch. 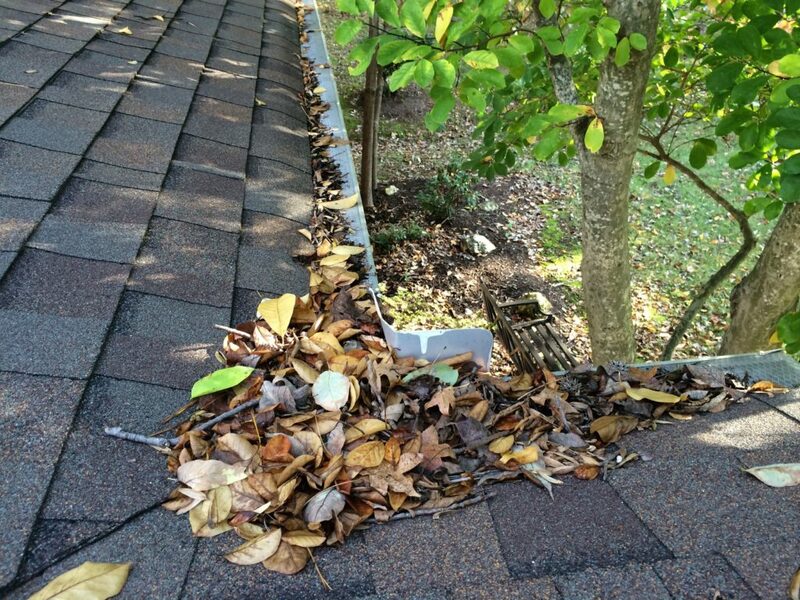 As we were installing the gutter guards, leaves were dropping from the trees faster than we could keep the leaves out of the gutters, so we had to scoop out the leaves as we progressed down each gutter section. We also added a series of metal roof diverters to move water away from the inside corners, and onto the main roof to minimize the chances of water spilling over the gutter guards in spots where there were higher volumes of water. This case illustrates of the importance of vetting your gutter contractors before hiring them to ensure they have a good reputation (see Don’t Hire a Gutter Contractor Until You Ask These 5 Critical Questions). Whether it’s checking them out with your local BBB, viewing their rating on HomeAdvisor, or calling previous customers for a referral, it’s important to understand their capabilities. In this particular case, she paid about double what we would have charged her to complete the job; she received the wrong sized gutter guard for her house, and it was installed incorrectly. The contractor’s first-rate hack job caused water to leak into the homeowner’s basement. And it resulted in her having to hire us to diagnose and fix the problems the other company left in its wake. Even though Rhino gutter guards include a 25-year manufacturer’s no-clog warranty, the guards were not covered under warranty because of they were undersized and improperly installed. It wasn’t a product problem, it was an installer problem. Unfortunately, it became the homeowner’s problem. In the end, she had a good attitude about it, knowing that she had no choice but to resolve the water issues. Although her wallet was a lot lighter as a result of having to pay to do the job twice, she was happy that we could help her fix her gutter problems once-and-for-all. If you’re looking for help with your gutters and gutter guards, let us know. If you’re located in our coverage area, please reach out. If you’re outside our territory, we recommend HomeAdvisor as a trustworthy source for finding a gutter guard contractor in your area. Do you have a story to share about a gutter guard experience gone wrong? Please leave a comment below or reach out to us, and maybe we’ll feature your experience in an upcoming article. 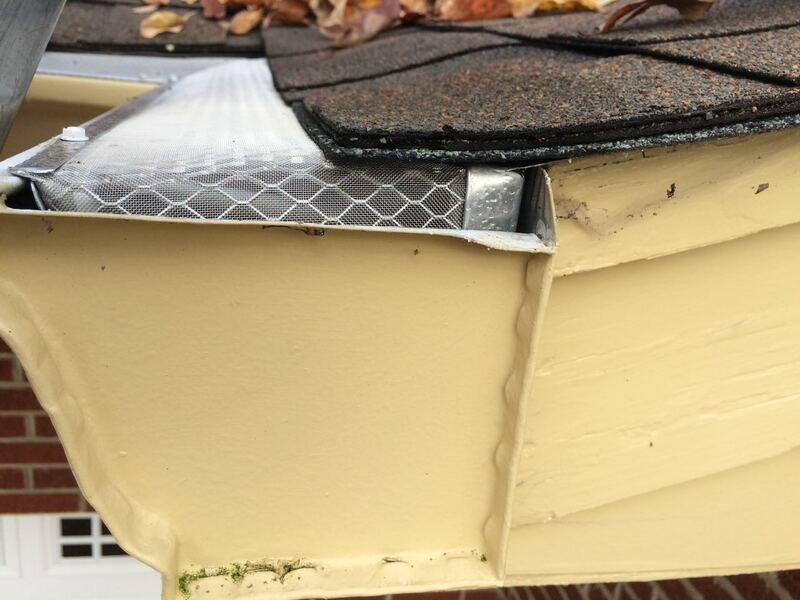 Previous story What is the best gutter guard for my home?